Press reports say that Venice is currently (2018) suffering from ill-effects of mass tourism, which is forcing some local residents to move out of the city. Officials have responded by monitoring visitor numbers and launching the #EnjoyRespectVenezia campaign. 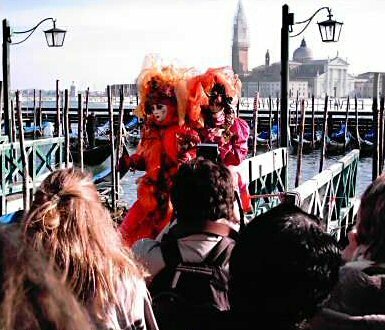 We love Venice, so we can't ignore this development - Venice owes it's history and traditions to the people who live there. So here are our thoughts on what you can do during carnival time. Use the excellent public transport system. You can't drive in most of Venice anyway (it's all canals, remember) and most hotels don't have parking. Hiring a car at the airport is pretty pointless, because although you can park outside the city, you still have to get public transport into the centre. It's much the same for motorbikes and mopeds. Bicycles are impractical too, because of the number of people on the streets and number of steps (even if the bicycle is being pushed). From Venice Marco Polo airport, there's an express waterbus service run by Alilaguna which runs frequently and will get you into the city centre. Buses and water taxis are also available. From Venice Treviso airport, there's a coach service. From further afield, trains and coaches will get you straight into the city, unless you're arriving very late at night or very early in the morning. There are overnight sleeper trains from major cities in Europe. For getting around Venice itself, the ACTV vaporetto (waterbus) service is quick and convenient, and runs well into the night. You should expect to do a fair amount of walking around the city, but the authorities have accessibility maps if you need them. Water taxis are available, but their prices may seem more like a limousine rental than a typical taxi fare in Europe. Stay local and pay local. Support local businesses by staying in local hotels (not big chains), buying event tickets through official suppliers (not overseas ticket agents), buying souvenirs from local artisans and crafters (e.g. Murano glassmakers), and eating the local food in local restaurants (not big chains). This helps ensure that your money stays in Venice, with businesses that pay their taxes to support the local community and keep the city's infrastructure working. Try to visit the city centre on quieter days. The city authorities publish visitor forecasts to help you decide which day might be best. From our experience, weekends mean longer queues for everything and very crowded streets between St Marks Square and the Rialto bridge. On days like these, attractions on the outskirts of the city may be a better choice. 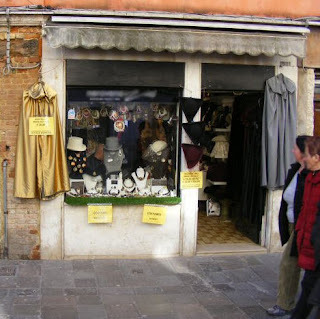 The City of Venice Detourism site has suggested itineraries, including hidden gems that are off the main tourist trail. If you buy takeaway food, choose carefully where to eat it. It used to be common for visitors to eat and drink while walking around St Marks Square, or while sitting on steps outside monuments and historic buildings. This was causing various problems, some of them unintentional, and is now banned. Find one of Venice's public gardens instead. Don't feed the pigeons or other wildlife, because this just causes problems for other people. Re-use, recycle or dispose of any litter, and if you can't find somewhere to put it, take it back to your accommodation. For full information on making the most of your stay, while helping to keep Venice looking beautiful for years to come, see the city's web site.